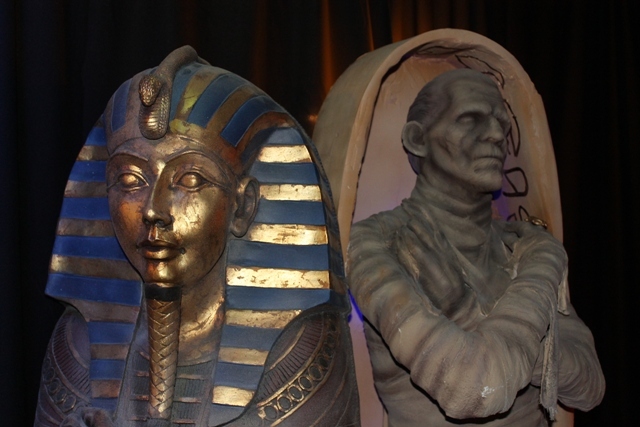 Horrorhound Weekend: The Macabre Secrets of MASK-FEST! 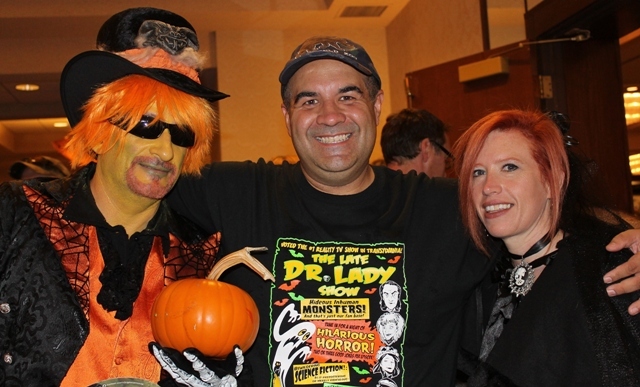 It was a last minute decision going to The Indianapolis Horrorhound Weekend this past September. Not for lack of interest, mind you, but for practicality. I’d already resolved the fact that I was going to have to skip this one as I’d stretched myself too thin over the summer and was facing another week long conference in North Carolina with my Brookfield Zoo AAZK Chapter two weeks later. There was one aspect of this show, however, that gave me pause. 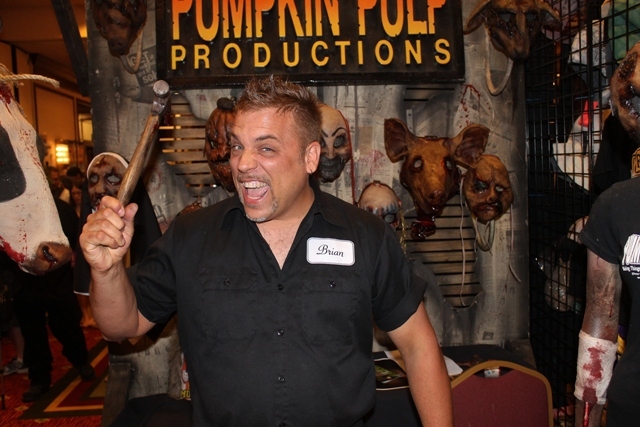 While there are two Horrorhound Weekends taking place each year here in the Midwest, only one boasts the addition of MASK-FEST. 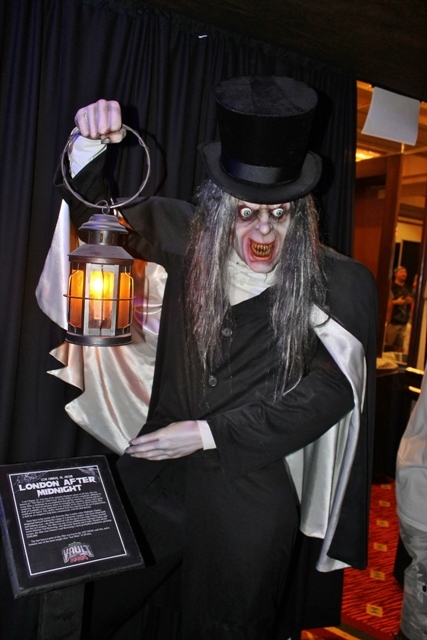 This event is a convention in and of itself and boasts the talented creations of those who forge the very things the holiday embraces – scary masks and props! Ultimately it was my kids that would convince me to make the journey. 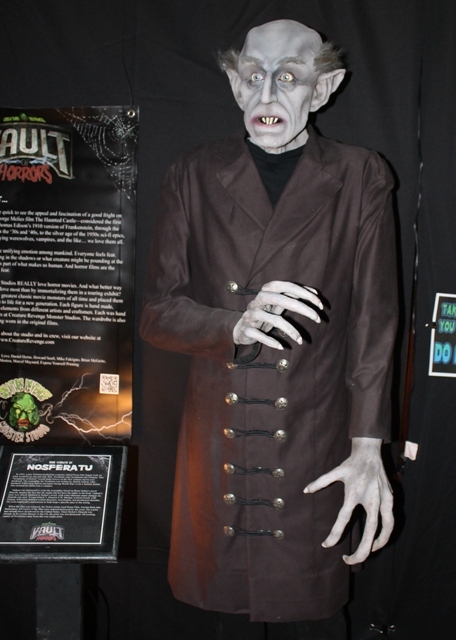 Since this blog began, I’d never brought my children with me to horror events. G-FEST was always family oriented so they’d been attending those since birth but I was never sure when the right age was for them to be introduce them to fandom’s more macabre offerings. Things began to change this past year when my daughter, Jade, not only declared herself a horror fan but a new devotee to one of my all-time favorite films; Dark Night of the Scarecrow. My youngest child, Luke, is also blooming into a horror fan with a particular love of monsters like his old man. This convention would offer something for both of them and I decided it was time to test the waters by bringing them along for a day trip. We’d have to economize of course but, when you have five kids, that’s something you learn how to do early on. I packed us lunches as if we were going to the beach and secured passes from my friend, Eric Austin who runs the HMA (Halloween Mask Association). 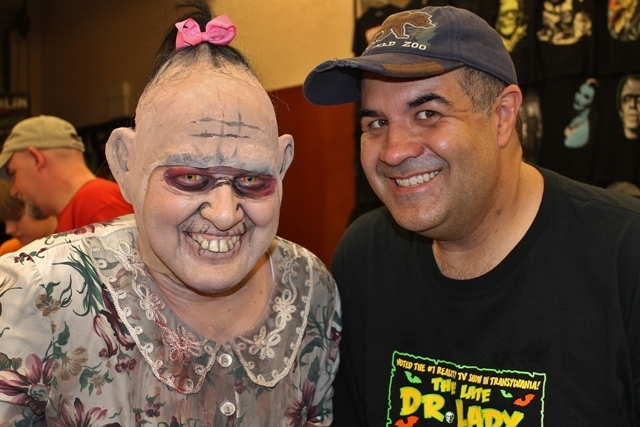 I’d met Eric via the other Terror Dave (who collected masks) but he and I hit it off on our own this past year via the last Horrorhound in Cincinnati as well as The Fright Night Film Fest in Louisville. According to Eric, I’m way more fun when I’m solo. I’m guessing that’s because when I’ve gone to HH with David, I’ve acquiesced to his being a “beer” person by sticking to beers even though I’m a wine and hard liquor kinda guy. My theory is, if the goal is to get buzzed, why walk to The Promised Land when you can fly? Now before you start planning my Intervention I should add that I rarely drink in my everyday life, can’t stand bars, and rarely if ever drink alone. 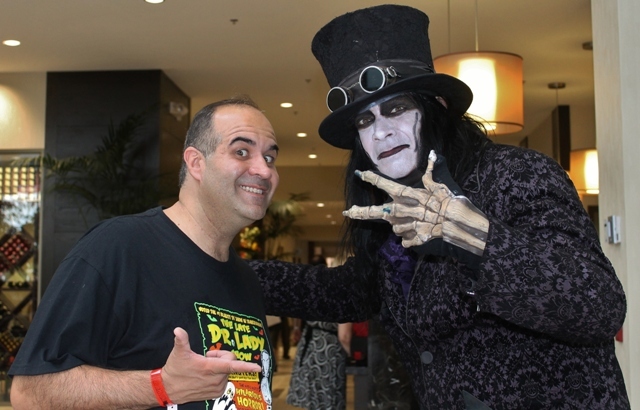 For me it’s a social thing and what better place to get social with fun people than at a horror convention (Side note: the same would prove true of that zoo convention I mentioned)? Needless to say, with my kids in tow, there would be NO alcohol on the agenda for this outing and we arrived at the Marriott in Indianapolis shortly after the event began that Saturday morning. The last time I’d been to this venue was at the March 2011 Horrorhound Weekend and hotel upgrades made it almost unrecognizable. I sent a text to Dr. Destruction that I arrived and he ended up bringing us passes which I assumed were from Eric. The last time I’d seen the Wisconsin PA host was at Flashback Weekend just a couple of weeks earlier but this time he seemed much happier. My kids have met Dr. Destruction before but still seem to stare wide-eyed whenever he’s around, I can only imagine what he’s like to them as he’s a tall guy in his own right let alone when wearing his platform boots. We separated after that and I only saw him briefly again when I bumped into Halloween Jack & Jacqueline. They both looked great which is a blessing since they’ve both had suffered health issues this past year. We walked into MASK-FEST and didn’t know what to ogle first. After walking barely five feet we heard a guy behind one of the booths yelled, “Hey Dave!” It was Paul Daniels from Darkside Studios. I said hello and we talked a bit but I wondered if he’d mixed me up with David (who’d bought a mask from him the last MASK-FEST we attended). You see despite Eric’s appreciation of me as a lone Terror Dave, it’s Mr. Albaugh that’s the expert on masks while I just know how to party with their president. 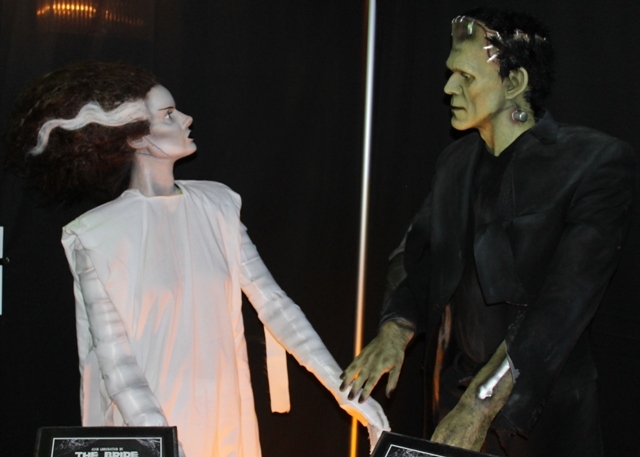 Before checking out this years offerings there was a cool room that featured replicas of The Universal Monsters among others. 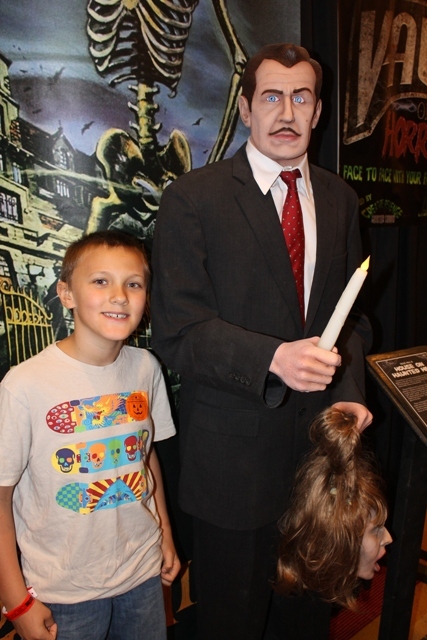 It was guarded by a life-like Vincent Price. We decided to enter at our own risk and it reminded me of a lesser detailed Count Orlok’s Nightmare Gallery from Salem (which you can see HERE). I was glad I showed up for this because I got to see a lot of friends (which had my kids thinking I’m some kind of a superstar) including Jason “Egg” Brown and Sigmond Zoid from The Vortexx! Also in attendance were The Ghouligans and the guys from Freakhouse Flicks! Seeing these folks made me realize how out of touch I’ve become since giving up our weekly Horror Host Report almost a year ago. Since then many have asked which horror host pissed us off and led to that decision but, the truth is, NONE of them did. We had no bad experiences and enjoyed working with them. What I said back then was factual; we just didn’t have the hours every week to do it anymore. I’d feared that my scathing review of the last Horror Host Hall of Fame would have put me at odds but the only ones who did contact me about it did so saying they knew where I was coming from. I have heard that Dr. Destruction and Halloween Jack are now at the reigns and I do wish them luck. I probably won’t be in attendance as I’ll be on a two week cross-country zoo vacation with the other Dave. As for the report, however, you’ve not heard the last of it. 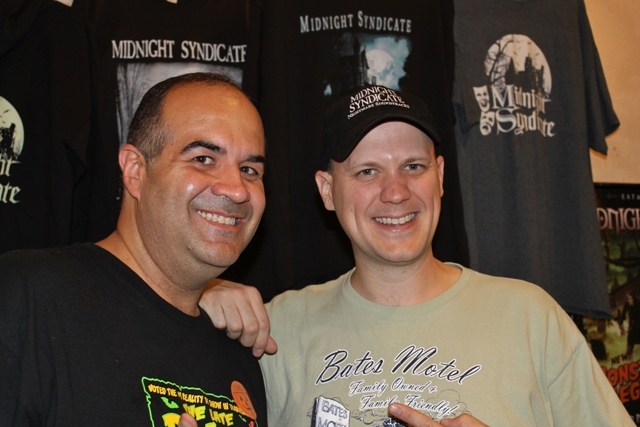 Another friend I bumped into was Ed from The Midnight Syndicate. 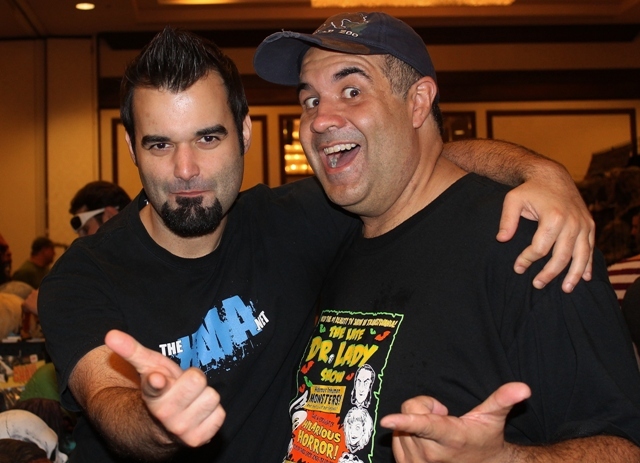 I’ve been seeing Ed at so many conventions lately you’d think I was a fellow dealer. He was in great spirits as their newest CD Monsters of Legend is selling like hotcakes (you can read about that awesome Universal-inspired collection of tunes HERE). 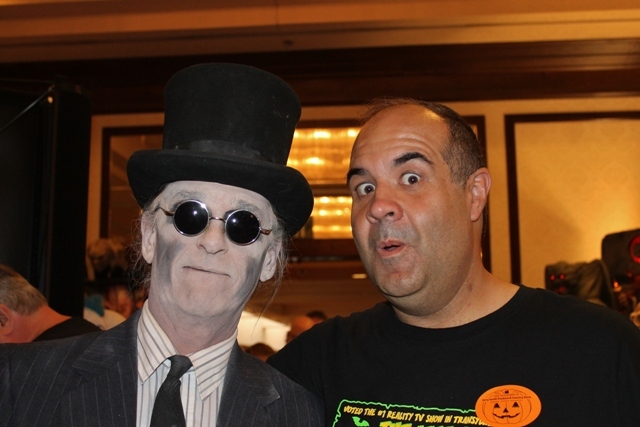 FINALLY, after getting reacquainted with so many of my fellow horror pals, I found the great Eric Austin. As usual, he was manning the Trick or Treat Studios booth and looking pensive (the guys got an entire Facebook album of photos that make him look like a best-selling Mystery writer). He gave me a hug and we talked a bit about how the show was going. He seemed to be having a great time but was sorry I wasn’t alone and wouldn’t be staying for the after party. Eric’s a blast and I admit I had a taste for whiskey just talking to him. If for no other reason to have the guts to ask him exactly how much time it takes to sculpt that goatee of his. 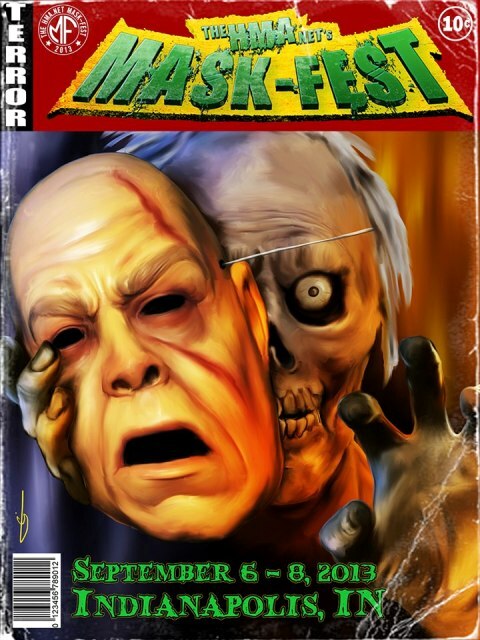 Coming up…the Masks of MASK-FEST! 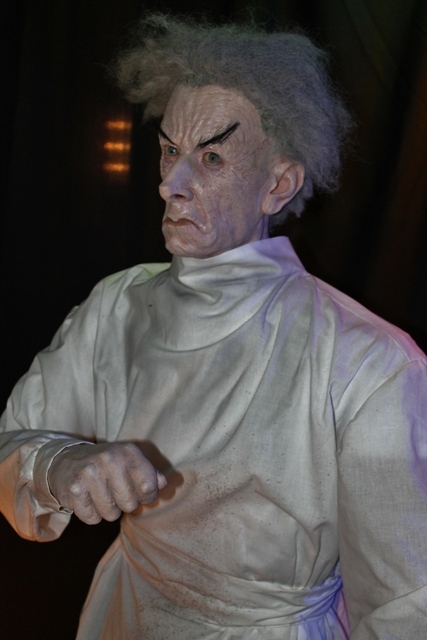 This entry was posted in Convention & Expos, Halloween, Masks, Models, & Props! and tagged Eric Austin, Halloween Mask Association, Halloween Masks, HMA, HORRORHOUND WEEKEND, Mask-Fest, Midnight Syndicate, The Universal Monsters, Trick Or Treat Studios. Bookmark the permalink. ← Jack O’ Lantern Spectacular sets New England aglow this Halloween Season!